"Responsive" themes for Moodle are now available. These use Cascading Style Sheets (CSS) to adjust the display of content to suit the size and proportions of the display device. The default "clean" theme provided with Moodle Version 2.9.2+ displays the traditional three column format in landscape mode, but in portrait mode on a mobile device switches to a single column more compact display. This is magical to watch if you have not seen it before: simply rotate the device 90 degrees and watch the format of Moodle pages magically change, then rotate another 90 degrees and they change back. 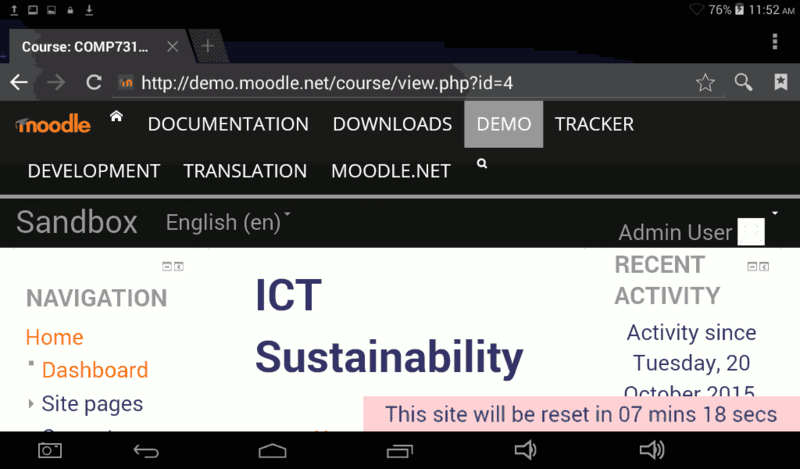 Screen-shots are shown of landscape and portrait screens on the 7 Inch XO Tablet running Google Android, using the Online Demonstration of Moodle (Version 2.9.2+ with default theme). However, this responsive design can't fix a badly design course. For a typical week of a course I have one link for notes, one forum and one quiz. All this will fit on a smart phone screen. Some courses I have seen have a dozen links for one week: this will not fit on a small screen (how is a student is supposed to follow it all anyway?). Similarly, I use simple web pages (using the Moodle book module) for notes, with just one column of text, which wraps to fit on the small screen. If you have multiple columns of text in a document, this will not display well on a phone (but why would you ever design an electronic document with multiple columns of text?). At the moment I am a student of mobile learning: that is learning how to design courses delivered using smart phones and tablet computers. I did not actually own a mobile device when I enrolled in the course (just a laptop with a wireless modem). So I purchased a 7 inch Google Android Tablet: first I tried an a Onix Kids 7" Tablet from Aldi which did not work well (so I sent it back) and then an a XO Tablet which does work well. I have a smart phone on order (Lenovo A588T Android Flip Phone). Existing course materials work on a mobile device. 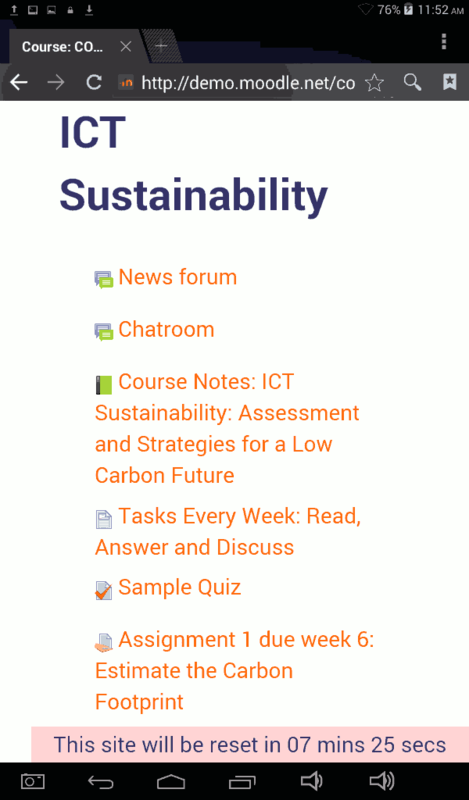 Students can read course notes, take part in a forum discussion and do a quiz in Moodle. The question then is what ways could a mobile device be used to go beyond this traditional e-learning?